The Nevada System of Higher Education (NSHE) will be submitting a proposal to the National Science Foundation’s (NSF) Established Program to Stimulate Competitive Research (EPSCoR), Research Infrastructure Improvement (RII) Track-1 program in summer 2019. 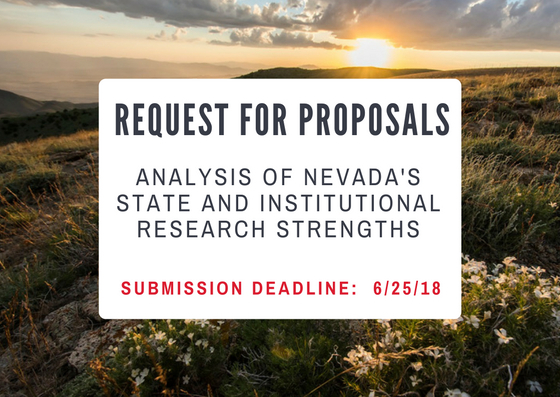 To strategically inform the selection of a research theme for the proposal, NSHE is seeking an analysis of its state and institutional research strengths so that the Track-1 proposal builds on the existing strengths and critical mass of expertise. Submission Deadline: 6/25/18 by 5:00 pm PST. EPSCoR was started in 1978 to assist NSF in its statutory function “to strengthen research and education in science and engineering throughout the United States and to avoid undue concentration of such research and education.” EPSCoR goals are to provide strategic programs and opportunities for EPSCoR participants that stimulate sustainable improvements in their R&D capacity and competitiveness, and to advance science and engineering capabilities in EPSCoR jurisdictions for discovery, innovation and overall knowledge-based prosperity. Nevada has been an EPSCoR jurisdiction since 1985. NSF EPSCoR RII Track-1 awards provide up to $4 million per year for up to five years. They are intended to improve the research competitiveness of jurisdictions by improving their academic research infrastructure in areas of science and engineering supported by the NSF and critical to the particular jurisdiction’s science and technology initiative or plan. As per the NSF EPSCoR Track-1 FY18 solicitation, submitting states must describe the status of their academic R&D enterprise, including the strengths, barriers, and opportunities for development of the academic institutions in support of overall R&D objectives. The state must provide a convincing rationale for the project’s scientific vision and indicate how the overall strategy, proposed implementation mechanisms, and infrastructure support will mitigate the identified barriers and improve academic research competitiveness. The state must also explicitly describe the alignment of the proposed research with the STEM research priorities of the jurisdiction S&T Plan. NSHE includes three research institutions which participate in the Track-1 program. The University of Nevada, Las Vegas (UNLV) is an urban research institution with 30,000 students and $66M in research expenditures in FY17. The University of Nevada, Reno (UNR) is a land-grant institution with 20,000 students and $106M in research expenditures in FY17. The Desert Research Institute (DRI) is a soft-money research institution with $36M in research expenditures in FY17. The research area is fundable by NSF. The research area is in alignment with one or more of NSF’s 10 Big Ideas. To inform the selection of the best research area for the Track-1 proposal, the following analyses are requested. Mapping of DRI, UNLV, and UNR common research strengths. Mapping of the above common research strengths against NSHE’s 2015 S&T Plan research priorities, NSF’s fundable areas, and NSF’s 10 Big Ideas. For each overlapping area of strength and the priorities noted in #2, please provide the performance indicators and top research faculty at each institution (DRI, UNLV, and UNR). A report that summarizes the analysis methods used and the key results in graphic and tabular format with a narrative describing the key points. A meeting, via Webex online, with NSHE’s Vice Chancellor for Academic and Student Affairs, Vice Chancellor for Government and Community Affairs, Vice Presidents for Research, EPSCoR Office Director, and the NSF EPSCoR Project Director to explain the results of the analysis. Name and contact information for lead on this proposal. A brief description of organizational background in this area. Identify personnel who will produce this report and their expertise or experience in generating reports of this nature. The methodology and data sets used to create the report. The total cost of creating the report and meeting with the Nevada team, not to exceed $25,000. Examples of previously created similar reports may be included as attachments along with references or client lists. Proposals must be submitted to Marcie Jackson at mjackson@nshe.nevada.edu by 5:00 p.m. PST on June 25, 2018. See the recent news for the NSF and NASA EPSCoR programs.